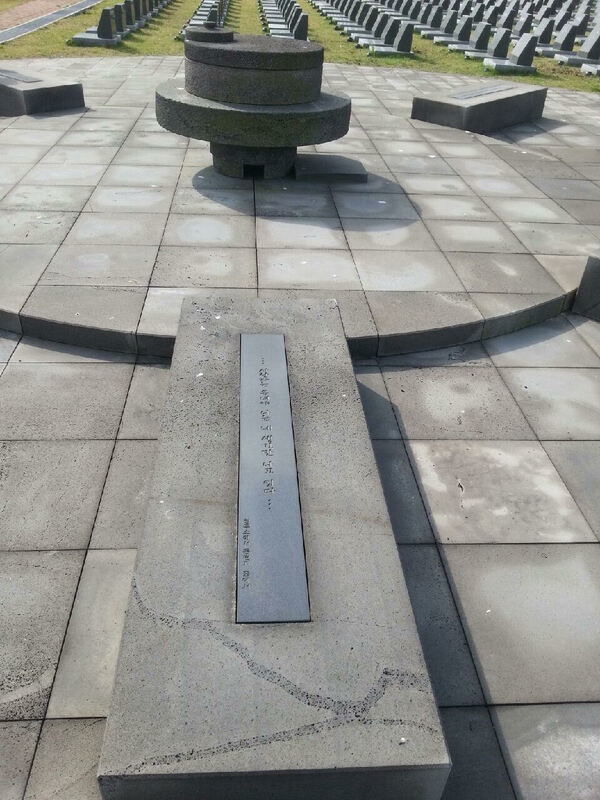 I visited the Jeju 4.3 Peace Park recently during a seminar about the April 3 incident that I attended on Jeju Island (October 30, 2015). 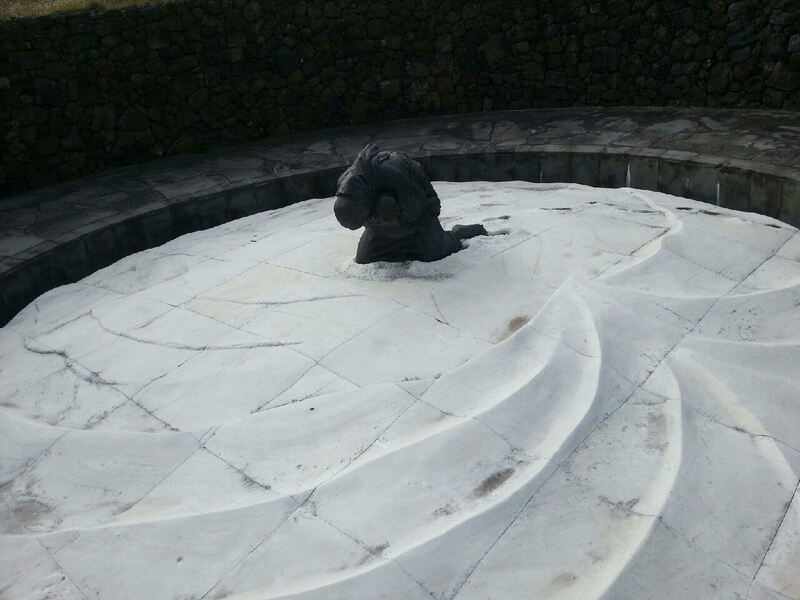 The monuments in the peace park are extremely subtle, but grow upon one over time. I would say you must spend at least an hour walking among the spaces there before you start to appreciate the symbolic power of the grey stones and solid masses that are placed in the midst of green rolling grass. 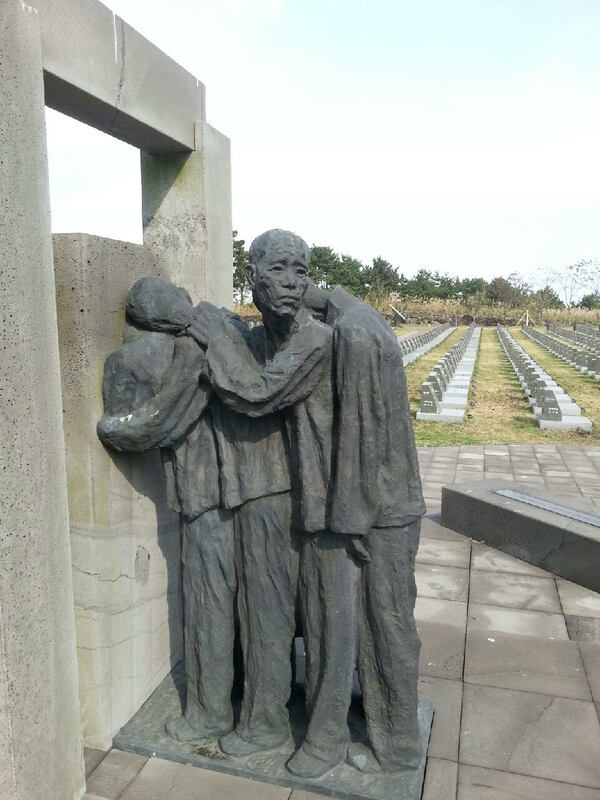 I knew a few details about the killing of tens of thousands of people on Jeju Island starting on April 3, 1948, and how the incident was actively suppressed for decades in Korea. But I had never spent any time thinking deeply about the significance of that event for Korea, and specifically the psychology required to keep killing people for weeks and months, not just for a few hours of rage. I do not think that I understand that psychology yet, but I do feel strongly that the first lesson about the 4.3 incident has something to do with human nature itself. I was deeply impressed by the sculptures at the 4.1 Peace Park and I feel that unlike many modern monuments that abound in Seoul, this one will survive the test of time. There was one work that I thought was haunting that was entitled “flying snow” (飛雪). 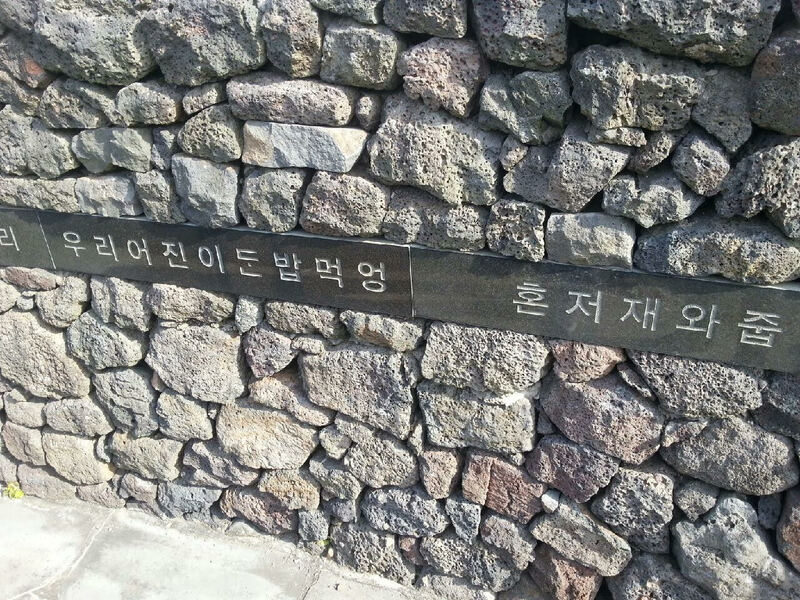 It is built on the exact spot that a young woman by the name of Byeon Byeongsaeng (변병생), 25 years old at the time, was shot in the back during the counterinsurgency operation by police sent down from Seoul. Byeon Byeongsaeng was hugging her baby daughter when she was shot by the officers chasing her and fell over into the snow and froze there. She is the equivalent of the unknown soldier among the thousands killed in a senseless paramilitary operation, but the symbolism of the sculpture is particularly striking. The observer can only get to the plane of snow where the mother and daughter are caught forever in that last moment by passing along a spiraling pathway with walls on both sides. In a band that runs for the length of the wall is inscribed the simple words of a lullaby. But what does that lullaby signify? The more I thought about this question, the more complex the significance the work became for me. At the most basic level, the lullaby was sung to the baby by her mother to try and comfort her in the midst of the tremendous chaos and cruelty that the family encountered. Such human actions were entirely beyond anything that a tiny child could possibly understand and thus the lullaby was the only possible means of understanding and of communication. At the same time, the lullaby had the same effect on the mother as well. Although she could perhaps understand better that she was in danger and that there were hostile forces following her, she, a women from a farming community in Jeju, could not possibly understood the politics and the strategy behind such seemingly senseless violence. In a sense, she was as innocent as the baby. Yet, ultimately, the lullaby is meant for us, the modern reader, reading over these artifacts and trying to understand past events. Although we may know the history, and the larger political and social factors behind the killings, we ultimately do not understand the meaning of those events either, we do not really comprehend what it is in human nature that leads men do engage in such terrible acts. 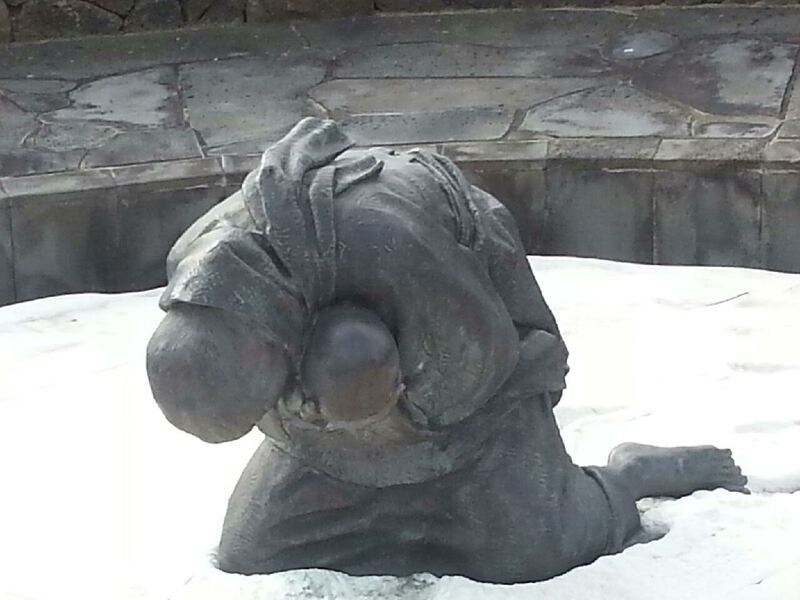 “Flying snow” is made of carved marble in the shape of the snow shaped by blowing winds into which Byeon Byeongsaeng collapsed after being shot. Mother clutching her baby more tightly as life flows from her in the forgetful snow. The space with the mother and daughter in the snow can only be reached by a spiraling walkway which is surrounded by a wall made up of volcanic rocks (each representing one of the dead). Down the middle of the wall is a band with a lullaby carved into it. 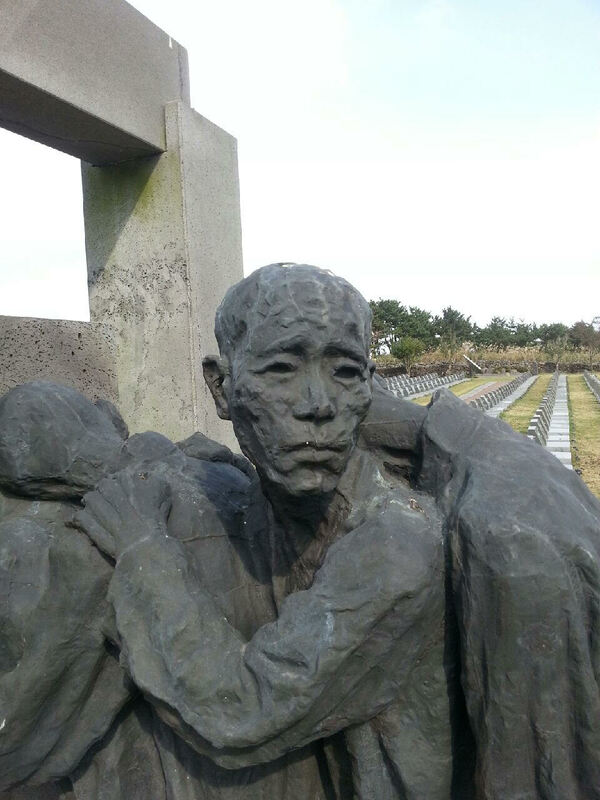 Man looking back from among those rounded up to die. Close-up of his resigned and rather puzzled look. Inscription taken from an actual letter sent to the concentration camp where people were held. Thank you for writing this excellent piece on your experience at the 4.3 park. If I had known the whole story behind these sculptures I think my photographs from the day would have been different. Reflecting on it now, perhaps that’s why I took mainly very wide shots that just captured the scene, but didn’t tell the story. I’ll have to educate myself further on the topic and go back again someday. It was a pleasure to meet you and now read some of your work. Do you think you will write more about Jeju in the future? I would love to come again and write at greater length. We need to compress what is in the historical records into something poetic and powerful.